World number two mining company Rio Tinto (NYSE:RIO) on Wednesday announced a huge slide in profit for the first half of the year with net earnings collapsing by 80%. Profits dropped from $4.4 billion last year to $806 million in the six months to end-June largely on the back of slump in the price of iron ore. Revenues dropped by $6.4 billion to $18 billion and underlying earnings for the Anglo-Australian giant came in at $2.9 billion in 2015 – down 43% compared to last year's numbers. 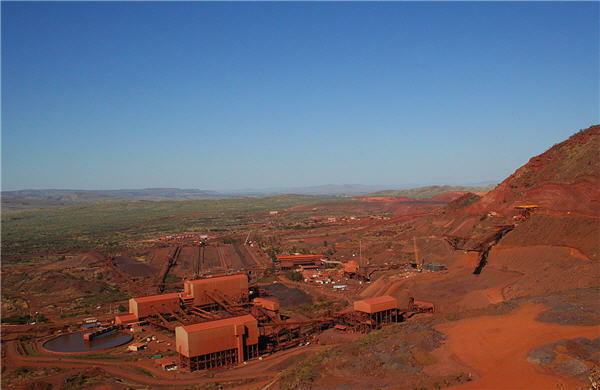 Iron ore contributed $2.1 billion of the total. Iron ore has recovered from a record low of just over $44 hit in July, but is still down more than 20% this year following a 47% fall in 2014. Rio said iron ore output of 154 million tonnes was 11% higher than last year following a ramp up in production from its core operations in the Pilbara region in West Australia. Rio hit its targeted annual run rate of 290 million tonnes in May. Iron ore revenues were also hurt by a decline in freight rates of $263 million over the six months. The Melbourne-based company said cost reductions, favourable exchange rates, volume savings and lower energy costs helped to offset the decline in the iron ore price. Pilbara cash unit costs were driven down to $16.20 per tonne in H1 2015, compared to $20.40 per tonne during the same period last year and $18.7 in H2 2014. Rio's said it's cut $1 billion of fat from its iron ore business since 2012. To give an idea of just how reliant Rio has become on the fortunes of iron ore the company calculated that every 10% movement in the price equates to a just over $1 billion impact on its underlying earnings. The same ratio for copper is only $183 million. Politicians have used the word collusion and some even called for an official anti-trust inquiry into the massive production expansion of the Big 3 – Vale, Rio and BHP. Competitors have accused the Big 3 of having a tacit agreement to drive down the price and drive out smaller players. 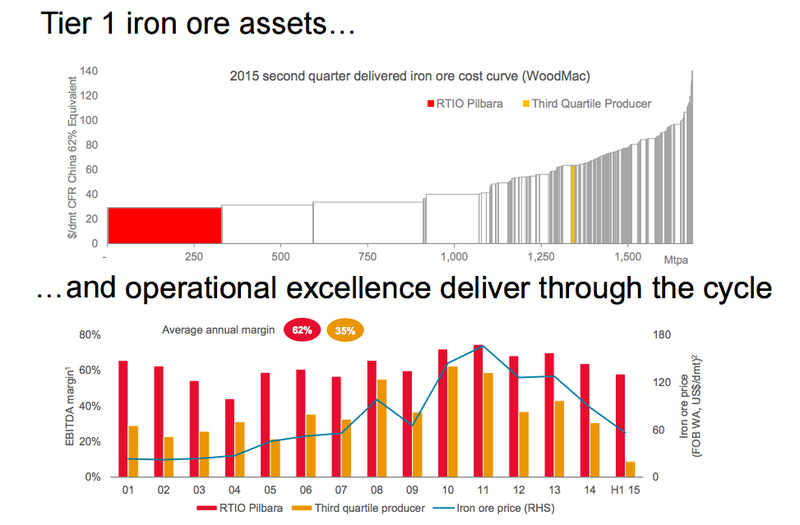 Whether the strategy has been deliberate or not this slide from today's results presentation shows just how difficult it is to go up against with iron ore's top tier and Rio particularly (62% margins for 15 years! ).